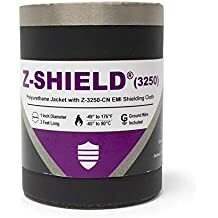 Shrink N Shield Pvdf - Shrink N Shield - Trade Names - ZT | Zippertubing Co.
0.1875" 0.25" 0.375" 0.5" 0.75" 1.0"
Shrink-N-Shield (PVDF) combines two proven technologies into a single, easy to install product for adding EMI shield protection to wire and cable bundles with diameters of 1/2" and less. Makes adding an EMI shield or secondary EMI shielding to wire and cable a snap. 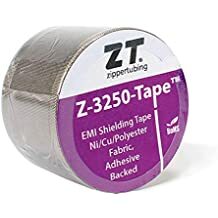 The product is comprised of a flexible, fire retardant, Polyvinylidene Fluoride tubing and Zippertubing's Z-3250-CN conductive cloth with outstanding shielding properties. The PVDF polymer jacket is a commercial variant of SAE-AMS-DTL-23053/18 tubing and the special formulation makes it more flexible than standard Mil-Spec tubing while still offering outstanding abrasion resistance. The product has an operational temperature range of -55 to 150°C. This product is supplied in four foot long sticks. Diameter Before Shrinkage 0.1875" 0.25" 0.375" 0.5" 0.75" 1.0"
A flame retardant Fluoropolymer heat shrinkable tubing that is very flexible and has extremely good fluid resistance. It is capable of operating in high and low temperature environments. Use in for severe duty electrical cable and wire applications.